As we lug the bulky winter gear down from the attics, and hunker down into the next stretch of the school year, many of us sense a dip in our moods. Feeling down seasonally, or just in general from time to time, is a natural part of being human. Some feelings and moods are mild or harmless; others less so. They’re usually temporary, but sometimes we can get mired in them for longer than we’d like. When we encounter external frustrations, or feel sadness or worry from within, we may feel that we are being overtaken by inevitable negativity, and we need to just wait for it to pass or inhale ice cream). But the truth is that there are therapeutic techniques anyone can use to actively reprogram our moods more favorably. One such tool I use regularly in my practice (and, to be honest, in my own head) is something I call the Horizon of Healthy Thinking exercise. Thought – feeling – mood – state of mind – personality. And it’s cyclical; lather, rinse, repeat. Some of our thoughts just pop up instinctively, in response to triggers inside or outside of ourselves. Many of them are automatic, spontaneous ideas that flow cyclically between our ears. When we are mostly generating thoughts organically that are either helpful or innocuous, our moods tend to be fairly good. But when the thoughts authored by our minds become unhelpful or upsetting, this tends to cause the mood to plummet. Not every situation is going to promote naturally happy thoughts. However, there is a method we can use to train our minds to meet reality where it is but process it into a psychologically healthy cognition. This will then precipitate more purposeful and useful thoughts, feelings, and moods. For this exercise, our thoughts can be categorized into three types: unhelpful, neutral, or helpful. I use a picture of the ocean horizon as a visual analogy. Picture the water with a strong riptide, or big, choppy waves crashing down, threatening to pull you beneath the surface, below the horizon. When we’re low, we’re struggling, being yanked under the waters of unhelpful negativity. This can feel like depression, rage, anxiety, hopelessness, toxic criticism, blame, or judgment — any potent, persistent, unwanted emotional experience. Finally, picture a seagull soaring upward, above the horizon. When we’re in a “good mood” we are generally producing mostly either helpful or neutral thoughts. This doesn’t necessarily mean positive; we can have helpful thoughts about a negative situation too, and there are times when misplaced positivity can be inappropriate and unhealthy. Above the horizon just means that we are functioning from a healthy place—approaching whatever circumstances we find ourselves in, with a productive, growth-promoting, or accepting mindset, like the seagull, gliding upward, over the horizon, toward the sky. The way it occurs spontaneously: below the horizon. Acknowledge the problem and the unwanted feelings. This is important because we can’t correct what we deny exists. The way it would look if it were less toxic: on the horizon. Describe the problem and feelings more matter-of-factly, from a place of calm and equanimity—maybe as if it were about someone else, and very solvable. The way it could sound if it were its healthiest permutation: above the horizon. Reformulate, paraphrase, and reframe the issue and the feelings in a way that promotes empowerment, growth, possibility, or acceptance. If this sounds abstract, I’ll demonstrate an example shortly. I’d like to point out that the “above the horizon” version should not sound phony-cheerful. It can and should be authentic to the experience and response, but just scripting it in a way that is more helpful to the thinker. Here is a very simple application of this technique in action, based on a true, recent incident. On the horizon (sailboat): Hmm… it seems that there is a problem with either my device or my connection. I use this phone for work, and I often get calls and texts that are urgent and/or time sensitive, so it’s really not great for me to be inaccessible like this. I’m not tech-minded, so I’ll need some help, and it usually takes some time on the phone with customer service to fix. Above the horizon (seagull): Oh, man, this is a real monkey wrench in a busy day. It’s a pain in the neck, but this is the downside of technology convenience. I need to be reachable, so I’m going to just have to reprioritize my to-do list so that I can make time to deal with this. I hope it won’t take too long, but whatever it is, it’s just one of those unexpected curveballs that has to be addressed. In the meantime, I’ll make whatever calls I can from my landline, and e-mail anyone who I think may try to reach me. It’s annoying but I’m sure this happens to people all the time; we’ll figure it out. See how the first reaction is overly aggravated and pessimistic, the second is just factual, and the third is constructive? This is the horizon method in action. This was just a small matter, but the technique can be applied to deeper feelings too. I actually need to do this sort of reframe a lot; I don’t naturally have great frustration tolerance for glitches, and even less for my own mistakes or ignorance. These minor obstacles can ruin a mood when internalized in unnecessarily negative ways. Yet, these same moments can feel empowering and motivating when processed as part of a good life, or even a learning experience. When we apply techniques like this regularly and to heavier thoughts about oneself, others, or the world at large, we begin to create newer, healthier thought patterns, which beget better feelings. Narrating our experiences in this more productive way, when practiced and repeated mindfully, can become a new cognitive habit which brings hope, empowerment, and increased happiness. Try it for yourself and see. Elisheva Liss, LMFT is a caffeinated mom, wife, writer, lecturer, and psychotherapist in private practice on Long Island. 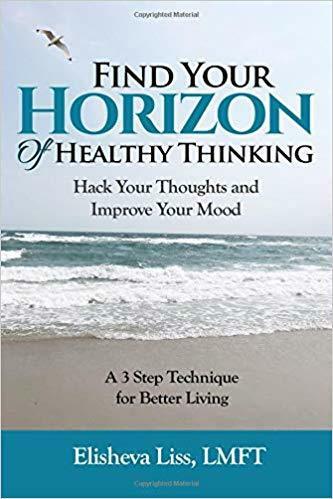 She has recently published her first book, on which this article is based: Find Your Horizon of Healthy Thinking: A Three- Step Technique for Better Living, which is available on Amazon. Writing is her favorite excuse for neglecting housework. Her website is ElishevaLiss.com and she can be reached at speaktosomeone@gmail.com.